SQL Server “ERRORLOG” is a vital tool for DBAs and Developers in order to know varied events that are logged in it. Thus, maintaining its growth and keeping the number of log files is important. We can keep up to 99 “ERRORLOG” files while 6 are default. To increase the number of “ERRORLOG”s, we can use the SSMS directly or we can use the extended Stored Procedure “xp_instance_regwrite”. You can use SSMS to perform the same task, expand the “Management” node in the Object Explorer, and right click the “SQL Server Logs” and select “configure”. SQL Server 2005 to 2008 Errorlog size can only be managed manually. While SQL 2014 onwards, a mechanism has been built within the tool to control the “ERRORLOG” size automatically. 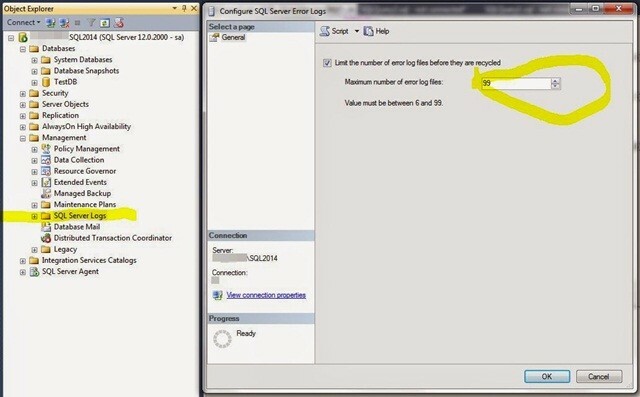 2.0.2: SQL Server 2005 to SQL Server 2014: To control the “ERRORLOG” size starting from SQL Server 2014, we can execute the following query to set the desired log size in KB. In the following example we have set the log size as 10MB (10240 KB).